Competenz print apprentices were recognised for their outstanding work at the Auckland Print Graduation last week. The graduation was hosted by PrintNZ and celebrated learners who have recently completed various print qualifications. 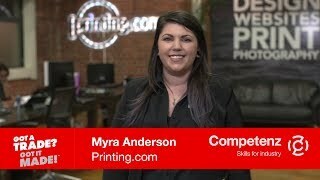 It was a double celebration for six talented Competenz apprentices who were announced as semi-finalists for Print Industry Apprentice of the Year. The apprentices, who are now all qualified tradespeople, finished their apprenticeships in 2015 after working in the print industry and alongside a Competenz account manager for three – four years. Each semi-finalist has excelled in various areas such as attitude, performance, ambition and timeliness, and has shown an outstanding commitment to learning and applying the skills they learnt. Sione Tonga carried out his apprenticeship with Stratex, a leading supplier of packing materials to food producers. His apprenticeship was his first job after moving to New Zealand in 2003, and has been beneficial for both him and his family. Faanuualii Suafoa, 31, completed his apprenticeship with PMP Print and said completing his apprenticeship was a huge milestone. “It’s a big achievement and is very exciting,” he says. The Print Industry Apprentice of the Year will be announced at the Pride in Print Awards at SkyCity, Auckland on 13 May. The award is a great opportunity to celebrate and recognise those who are achieving in the industry, and an opportunity to recognise their hard work in front of their family, friends and colleagues. The remaining semi-finalists are Andrew Jenkins, Mark Ferrett, Sarah Ruby Hay and Moui-He-Ofa Molisi Saulala. We wish everyone the best of luck!